CONSTRUCTION has started at Ridley’s greenfield feed-manufacturing site at Wellsford near Bendigo in Victoria, which with an annual capacity of more than 350,000 tonnes, is set to become the largest of the company’s 21 facilities throughout Australia. The Wellsford mill will supply expanding markets in Central and Northern Victoria, a prime grain-growing region. “This state-of-the-art facility will enable us to support the continued growth of poultry and pig producers in the region, and will help us realise manufacturing and logistics efficiencies,” Ridley managing director and chief executive officer Tim Hart said. Ridley’s intention to build the Wellsford mill was announced in September 2017, in part because its existing facility in the region at East Bendigo had reached capacity, and expansion would be constrained by its proximity to the town. Ridley has budgeted for a $45-$50 million expenditure on the mill, which is due for completion in April-June 2020. 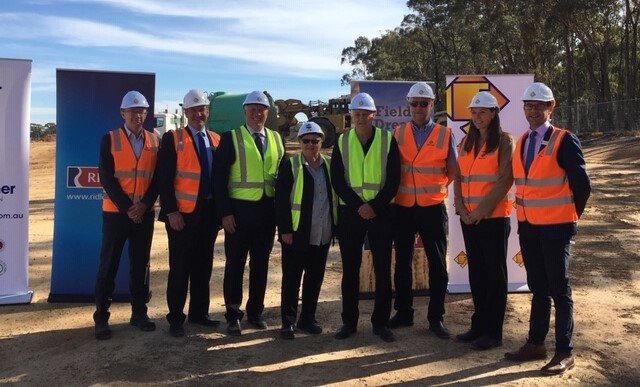 The start of construction at Wellsford was marked this week with a ground-breaking ceremony, which was also attended by representatives from the City of Greater Bendigo, and key construction and engineering partners in the project. The Wellsford mill is part of Ridley’s asset-renewal focus, and its opening will follow the expected completion of the its new aquafeed extrusion plant in Westbury, Tasmania later this year. In recent years, Ridley has opened two new sites in Victoria, a monogastric feed facility in Lara in 2017, and a ruminant feed facility in Pakenham in 2013.